Welcome to an afternoon of enchantment. 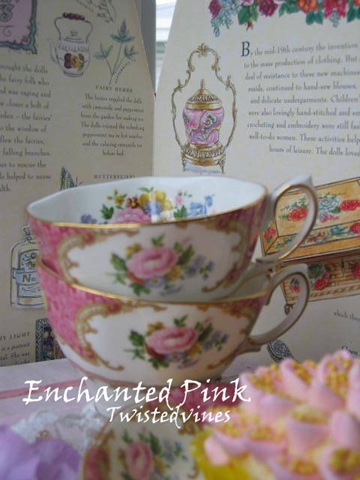 Of Enchanted Pink. 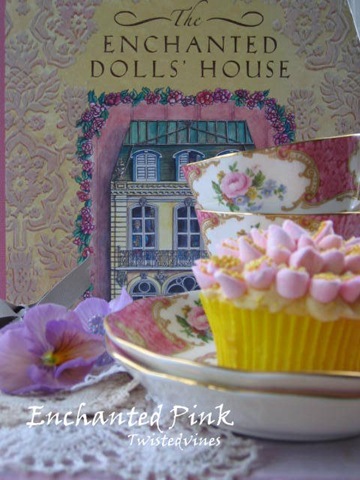 Of Victorian doll houses and stories, crystals,butterflies and cupids.Marshmallow flower cupcakes, lace and teasets. Welcome to Pink Saturday, where we share things Pink. 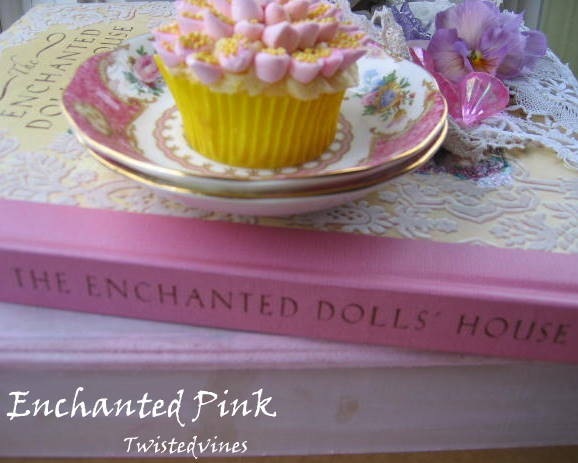 I truly have something wonderfully pink to share with you today. You’re introduced to ten little toys who lead you on an adventure through four very old doll houses. Starting with an Medieval adventure ,through to the stylish ‘the beautiful era’ La Belle époque.However my favourite the late Victorian secrets and romances. At each cut out dolls house there are windows that you peer into and see the beautiful, and intricate details of the illustrations by Robyn Johnston. A beautiful, magical tour, and lingering enchanting memories. On display today are my pretty lace centre’s, I bought last weekend for $2.00 (Aus), aren’t they such treasures. Spring pansies from the garden. 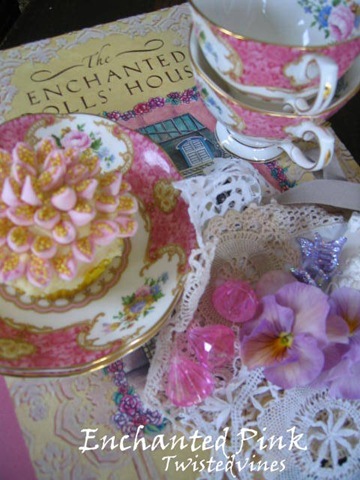 Royal Alberts ‘Lady Carlyle’ teacup set and marshmallow petal flower cupcakes I made yesterday, can be found here. Have a wonderful week, and thank you for all your visits and lovely comments. Absolutely gorgeous!! I would LOVE to have a book myself! I think I could lose myself in it for hours!! LOVELY! Where they can be purchased? Thank you so much for sharing and have a wonderful weekend! Both the book and your photos are fabulous! Happy PS. What a magical read Yvette. Thank you for sharing some of this beautiful book with us. What lovely photos, Yvette,,,so pink and pretty. 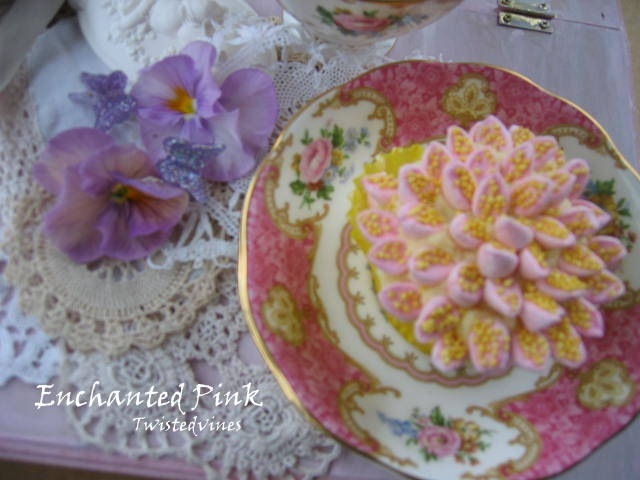 Love the china, cupcake, pansies, and all…I’m crocheting some pretty ‘lacies’ so I can appreciate yours. Perfect for Pink Saturday ! thanks for sharing this beautiful book. What a truly enchanting and lovely post!! How pretty! The book looks magical! I love all your pictures, especially your desserts ! YUM! Such a beautiful tea set Yvette. Stunning. 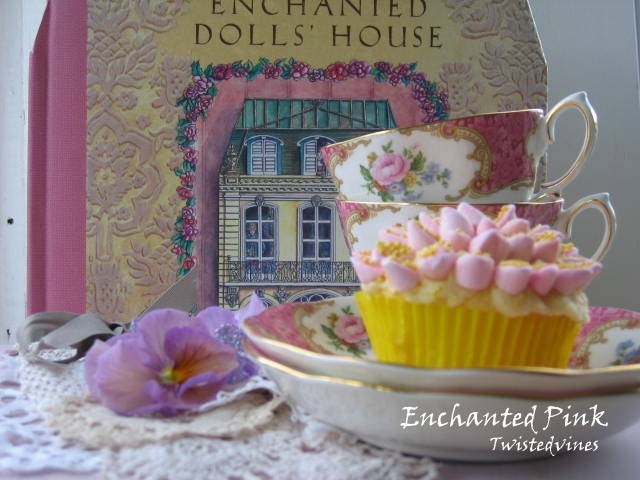 Oh a wonderful book, beautiful teacups & delicious chrysanthemum flower cupcakes! You know I’m enchanted by anything fairy related 🙂 Love your sweet pansy faces smiling up at me…I’m wishing we still had some around, but it won’t be too long before they’ll be available in the nurseries for late fall planting! The book sounds magical and a fun read. I have always loved dolls and fairies. Guess there’s still a little girl within me. Your flower petal cupcakes are darling. 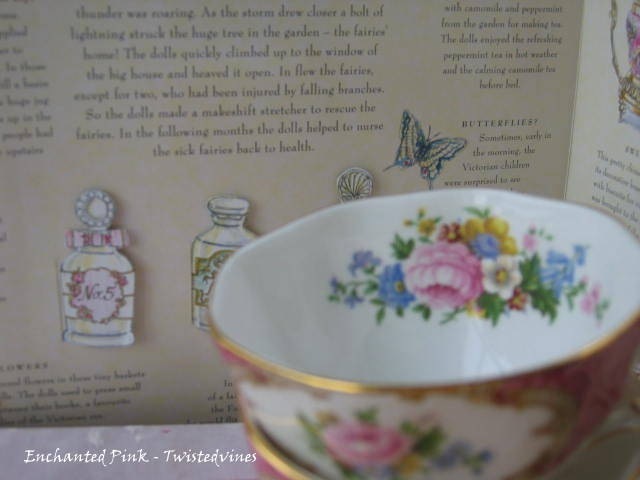 I love the Lady Carlisle teacups too. They are such a gorgeous pattern. I don’t own one myself but if I ever see one, it’s coming home with me! 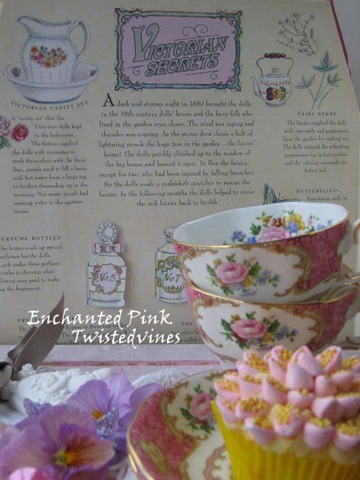 Thank you for sharing your magical post with Tea Time Tuesday and I hope you have a delightful week. What a sweet book! I would love to read it. Your tea cups are beautiful. I have them too! So you know I truly do love them. The cup cake looks so delicious and pretty as well. What a pretty feast for the eyes! Hi Yvette, thank you for linking to LACE this week. And the book is utterly delightful. Everything is so femminine and lovely! 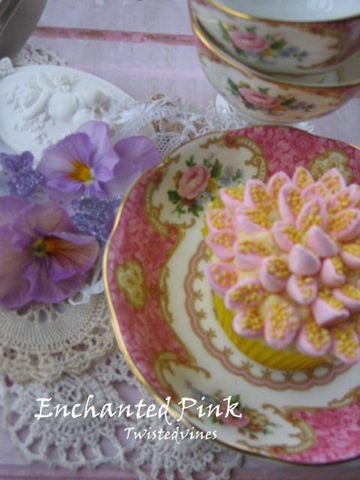 this is truly I lovely post..of course I adore the teacup paired w/ the cupcake! Thanks for linking it up last week, sorry for the delay in visiting. Have a super week!